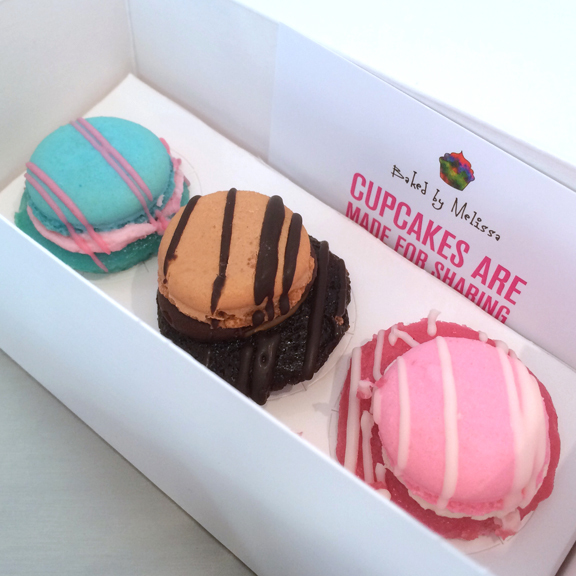 Baked by Melissa announced that they were offering some very special new flavors this spring… Cupcarons! What’s a Cupcaron you might ask? Well, if you guessed a teeny tiny mini cupcake topped with the smallest macaron you’ve ever seen, then you guessed correctly! Luckily, Crusader Elisa and I had already planned our annual girl’s weekend to NYC and we arrived in time to try these new mini treats shortly after they were released. I started with the Cotton Candy flavor because I don’t usually like cotton-candy flavored anything (unless it’s the real deal). I was actually surprised because it wasn’t awful. Maybe the miniscule size made it just enough to not be overbearing, but I would have glad eaten another. After that I moved onto the Strawberry Cream. Sadly, I wasn’t a fan of this one at all. I know that it’s nearly impossible to pack in real strawberry flavor into something so small, but it tasted way to artificial to me. Crusader Elisa didn’t love the Cotton Candy or the Strawberry Cream either, but she thought the Strawberry Cream was better than the Cotton Candy. I saved the Chocolate Graham for last because this flavor looked the most appealing (although the bright colors of the Cotton Candy and Strawberry Cream make those two much more fun to look at!). Of the three Cupcarons, this was by far my favorite flavor. However, compared to another flavor they had that day, Triple Chocolate Fudge, it was just “good.” The Triple Chocolate Fudge was AMAZING. What really surprised me was how crisp and perfect the macaron-tops managed to stay on all three cupcakes. I didn’t eat them all the same day they were purchased, and so I was expecting them to possibly get a little stale and chewy, but that didn’t happen at all. They were perfect. I’m not sure how long these Cupcarons will be available, so if you get a chance, definitely go try them for yourself! 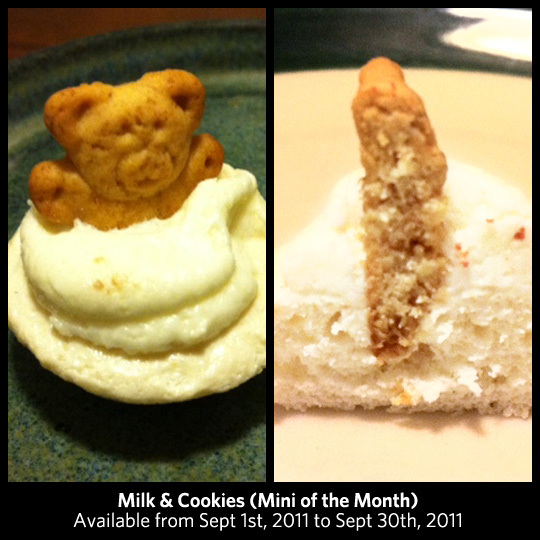 While we were there, we also had a chance to try Baked by Melissa’s March mini-of-the-month: Cookies in Milk. This little cupcake was SO GOOD and packed a lot of flavor. It actually tasted like cookies dipped in milk. 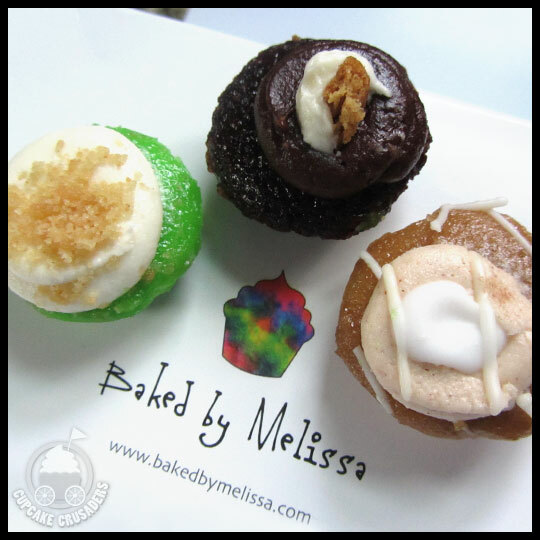 I don’t know how they do it, but Baked by Melissa has mastered the art of blending lots of different flavors in something that is so very small. We’ll definitely keep going back for more! Is there a place that you love to visit? Where the more time you spend away from it, the more you long to go back? One of those places for me is New York City. Back in my carefree 20s, with very few commitments keeping me in Baltimore, I used to spend countless days and weekends exploring Manhattan with friends, eating amazing food, wandering through galleries, and seeing the latest plays and musicals—I was even asked at one point, “Why don’t you just move there?” to which I responded, “Because I love Baltimore too!” Somehow, the older I get the less and less I venture to the Big Apple, so now when I do go there’s a long list of things I try to accomplish while there. Spending time with friends and seeing shows is at the top of my list, but right below that is the food (i.e. brunch, cupcakes, and whatever new place we stumble into). On a recent girls trip to NYC with Crusaders Jenn and Elisa, we had really high hopes for trying a new cupcake spot and getting macarons from Macaron Cafe. Sadly, neither of those things happened, but we did still manage a food-filled weekend that ended with cupcakes from our go-to, Baked By Melissa. 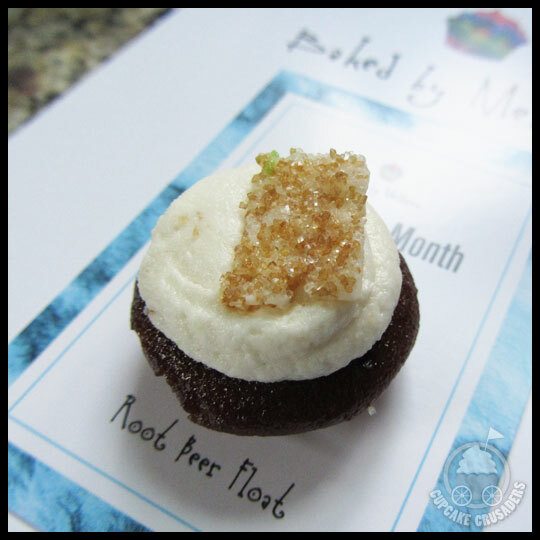 In addition to their July mini-of-the-month, Root Beer Float, Baked by Melissa released three summer flavors at the end of June that we knew we had to try. The three of us were unanimous in our feelings on these summer flavors: The Key Lime was good, but not great. I thought it was a little artificial tasting, Elisa wanted more graham cracker, and Jenn thought it was a bit more like a lime creamsicle in flavor. The Cinnamon Bun also left us wanting more. Baked By Melissa used to carry a strictly “Cinnamon” cupcake which was Elisa’s favorite, but we all agreed that this new take on it lacked the immense cinnamon flavor of the original. But the S’mores was exactly what we expect from these bite-sized treats. Even though there was just a tiny bit of marshmallow, it came through so well. If you are interested in trying these for yourself, they are available until September 22nd. We’ve tried just a few Root Beer Float cupcakes in the past, and this one definitely impressed us. 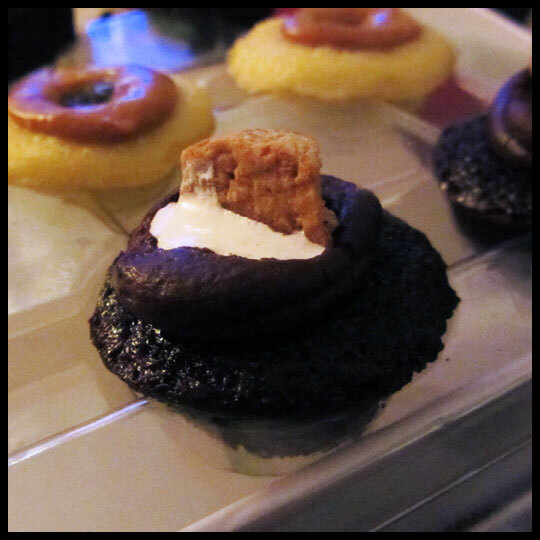 It had a true root beer flavor, and the crunchy sugar piece on the top was a nice added touch. We know it’s too late to get this cupcake now, but with any luck, it will make an appearance again next year. Besides Baked By Melissa’s, some of the highlights from the weekend were sliders and fries from La Frite, fancy iced tea from Press Tea, and savory and sweet mini pies from Pie Face. 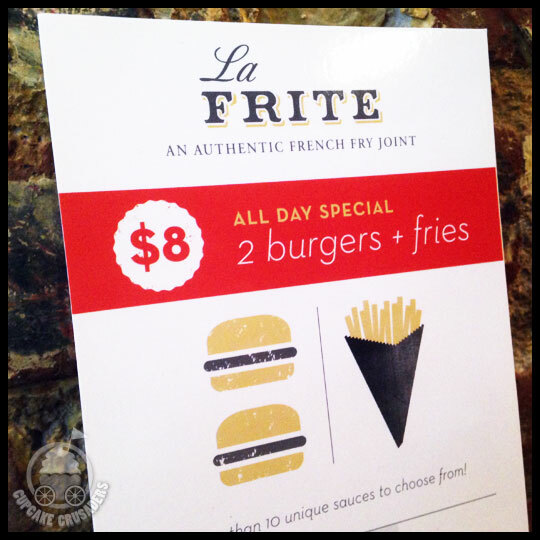 La Frite’s combo deal was too good to pass up, so Jenn, Elisa, and I shared an order of veggie burgers (SO GOOD) with their “classic” fries and beef burgers with their thinner “allumette” fries. They also have a long list of sauces so we picked BBQ Ketchup, Saffron and Garlic Aioli, and Wasabi Ginger Mayo. Everything was amazing. 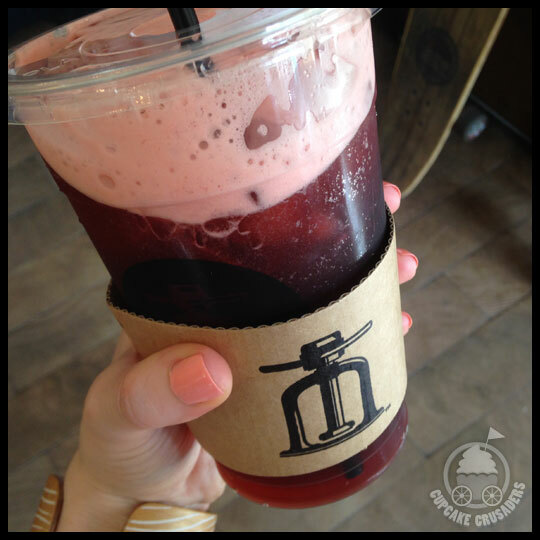 I can’t even begin to describe how much I loved the iced tea from Press Tea. I choose a Hibiscus Black Tea that suited my taste buds perfectly. Jenn and Elisa each picked something different and loved theirs as well—Elisa’s was some sort of chai-blend, and if there is chai on the menu, she’ll get it. Always. 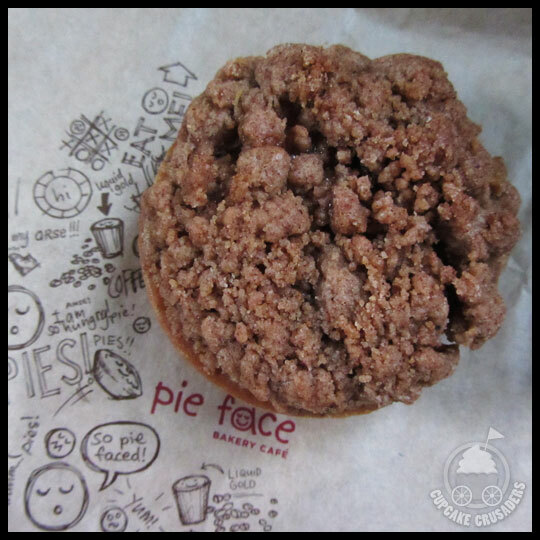 We have now come full circle back to minature-sized sweet treats, but Pie Face has more than just sweet pies, they also have a huge selection of savory pies, which we highly recommend. To feed my sweet tooth, I decided to take the Apple Crumb pictured above home with me, and I’m so glad I did. After heating it up a little bit, I plated it with a dollop of whipped cream and a glass of milk. For being such a small pastry, there was plenty of apple filling and crumb topping, with just the right amount of pie crust. Delicious. I’m not sure when I’ll make it back to New York, but I’m sure that whenever that happens, I’ll have plenty more food adventures. Prior to being a mom, I used to go to NYC with Crusaders Stacy and Elisa quite a bit. We have friends and family that live there, we love going to shows, and taking a day trip is so easy from our location. I ended up missing our annual spring overnight trip, which means that the last time I was there was when I was pregnant, a year and a half ago. Since I was craving a NYC girls’ trip and missing my friends, Stacy and I drove up for a day trip this fall. Stacy did all the research and planned our very ambitious day…six cupcake stops, five of them in walking distance (5–15 minute walks). We arrived in the city and made our way to the East Village. 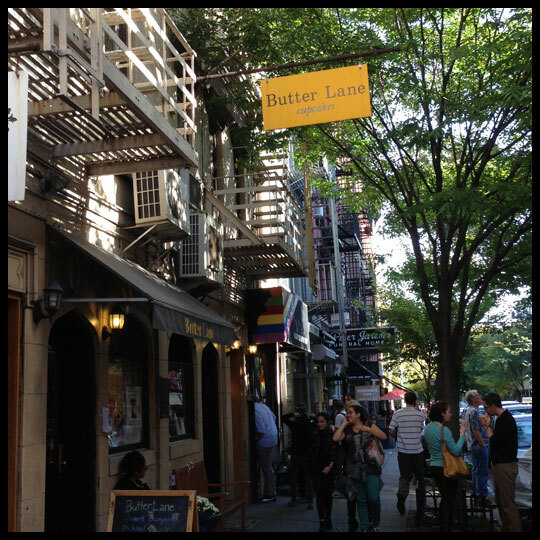 Our first stop was Butter Lane Cupcakes. The menu setup at Butter Lane Cupcakes was a little confusing at first. They offer three cake flavors (vanilla, chocolate, and banana) and then a long list of frostings to choose from. If they don’t have the combination you want already assembled, they will fix it up for you. When we first arrived there were people standing outside of the shop eating their cupcakes and it was crowded inside (always a good sign! ), but it cleared out quickly with the quick service that staff provided. Stacy noticed a Foursquare offer on the first check-in for a buy 2, get 1 free, so we took advantage of it. Banana with Cinnamon Honey frosting: Possibly one of my favorite cupcakes ever. I was really surprised because the frosting looked crunchy, but it wasn’t. After biting in I couldn’t believe how moist the cake was and it had the perfect balance of flavors. Banana with Maple Pecan frosting: Stacy thought that the maple overpowered the banana cake (I didn’t think so), but she still loved the frosting. Same super moist cake that was on the dense side, because of the banana. Chocolate with Chocolate Sea Salt frosting: Moist light chocolate cake with a rich, salty frosting and caramel drizzle. I would recommend this to anyone who loves the sweet and salty combination. 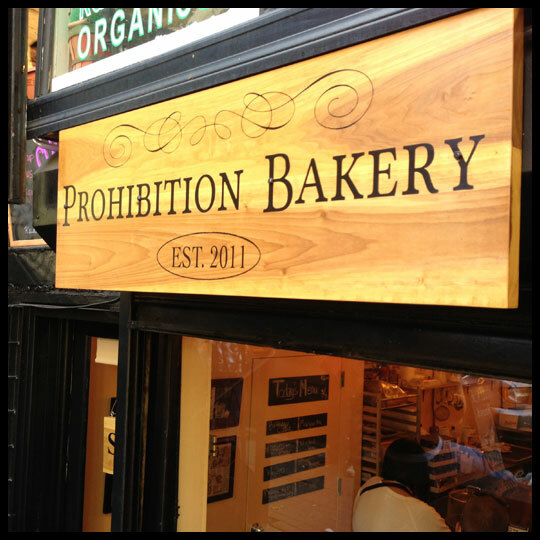 Prohibition Bakery is a basement bakery with just enough room to order your cupcakes, and a small bench inside. Luckily it was a beautiful day and the ledge leading down into the shop ended up being a great spot for Stacy and I to try our cupcakes. 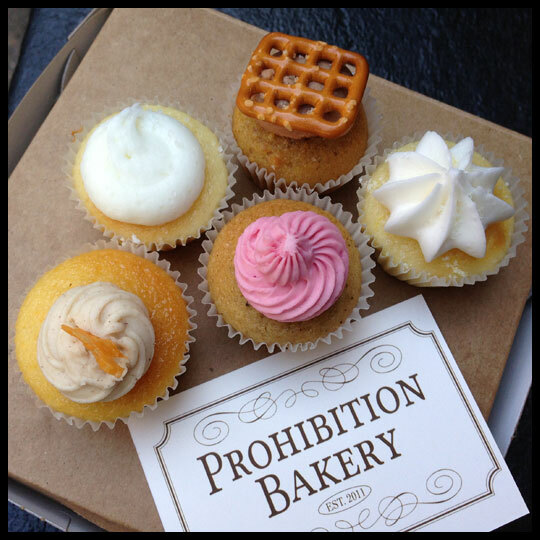 Prohibition Bakery only offers mini cupcakes at $2 each or three for $5. 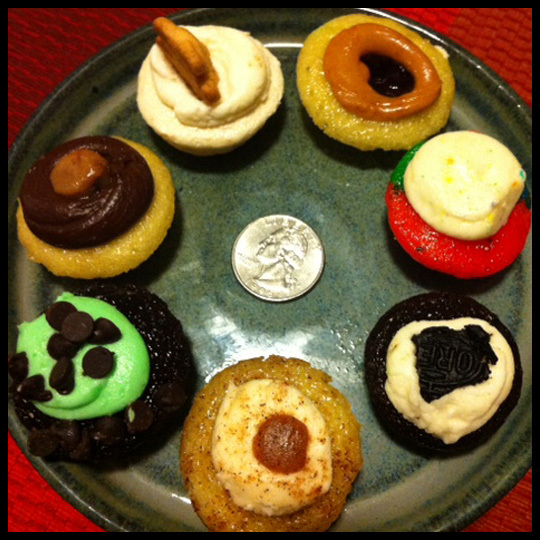 Margarita: I was surprised by how strong the booze in such a tiny cupcake could be! But, it was definitely a cocktail in cupcake form. 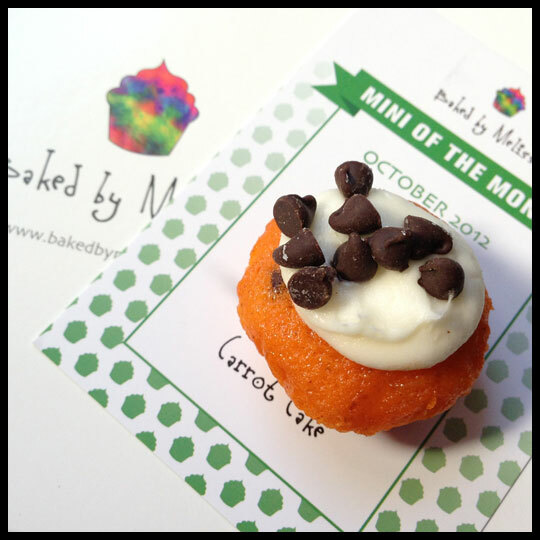 This cupcake stuck to wrapper a little more than I like for minis (since every bit of cake you can get is precious). But any margarita lover would appreciate this treat. The salt was perfect, like a salted rim. Beer and Pretzel: This cupcake didn’t stick as much to the wrapper, but it had a weird taste. Maybe it was the beer that’s used? I usually like beer breads and cakes, but I wouldn’t recommend this cupcake. Shiny Apple: Stacy said this cupcake tasted just like a Washington Apple shot (whiskey, Apple Pucker, and Hot Damn—instead of cranberry juice). She gave me a bite and I thought it was like spiked apple cider. It became our favorite here at Prohibition Bakery and was perfect for the autumn season. Mulled Wine: This mini treat was sweeter than the others, but definitely had a mulled wine taste. It was really good, but not a favorite. Birthday cake: Stacy said the vodka in this cupcake was strong and that it tasted exactly like what it was, a vanilla cupcake with vodka. The cake was moist, but a little crumbly. After eating lunch at One More Thai (across the street from Prohibition Bakery and highly recommended), we met up with Guest Crusader Jen and her husband James and all headed to Sugar Sweet Sunshine. We were pleased to see that there was seating inside, although it was packed, because more friends, Joanna and Greg, joined us. It was nice to be able to find a few chairs to hang out for a little while. 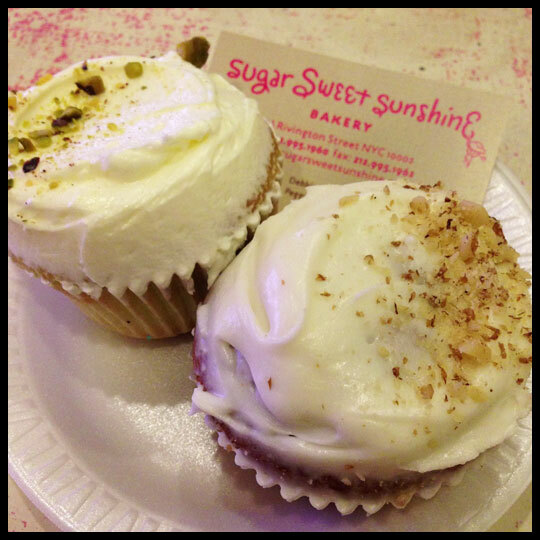 Sugar Sweet Sunshine offers more than just cupcakes, and is also known for their pudding trifles. We were all shocked to see that the regular size cupcakes were only $1.75 (especially our New Yorkers friends who are accustomed to higher prices). Pistachio: I got this cupcake out of curiosity, but was a little wary since I’ve never had a pistachio cupcake. 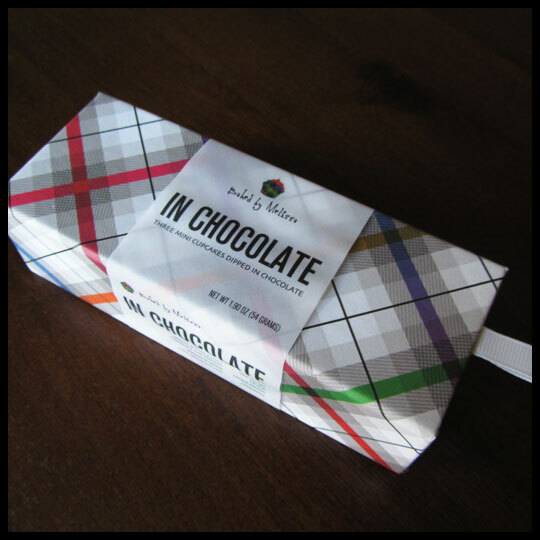 I was pleasantly surprised by the fresh nutty flavor, and moist, light cake. Because of the uniqueness, this may have been one of my favorite cupcakes of the day (coming in behind the Banana Honey Cinnamon from Butter Lane). Pumpkin: Stacy picked this cupcake and said the cake was also moist and light, especially for pumpkin, which tends to be heavier. Strawberry with Peanut Butter frosting: James got this cupcake and really liked it. He was surprised and pleased that it tasted just like PB&J sandwich, even having a taste of sandwich bread. Banana: Jen ordered this cupcake and thought it was good. She was expecting the cake to be moister for banana, but it had a good flavor and a tasty, light cream cheese frosting. Jen isn’t usually a fan of cream cheese frosting, so the fact that she liked this one speaks volumes. Coconut (not photographed): Greg and Joanna shared this cupcake. Joanna isn’t much of a sweets person (I know, I don’t get it either! 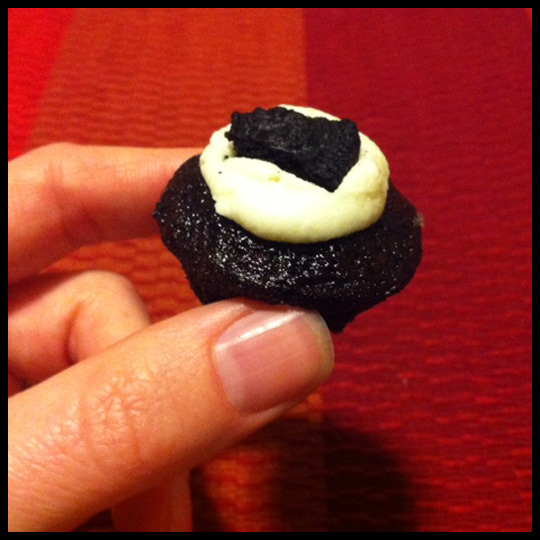 ), but they both enjoyed how light and moist the cupcake was, and that it wasn’t overly sweet. 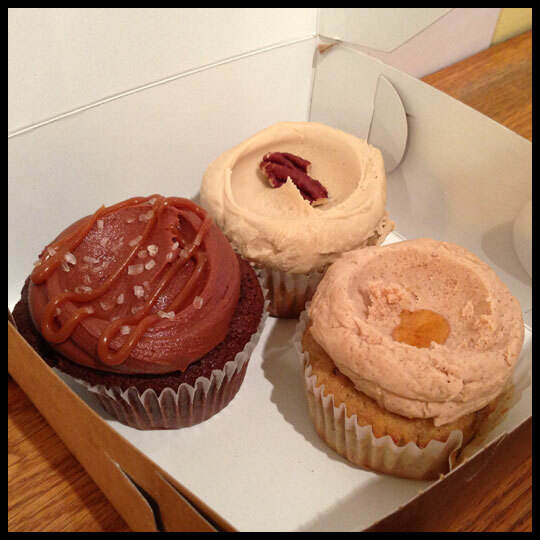 BabyCakes is a well know vegan bakery that uses spelt instead of wheat flour and doesn’t use refined sugars, but sweetens their cupcakes with agave nectar. They also make gluten-free vegan options, and all of their cupcakes are soy-free. The prices varied and were on the higher side. With the price and limited selection Stacy and I decided to share one. We were expecting it to be over $4, based on the price marked on the display, but it ended up being $3.75 (still the highest price of the day for a normal size cupcake). My guess is the specialty ingredients make BabyCakes cupcakes cost more, but it was our least favorite of the day and perhaps the worst cupcake we’ve ever had. Vegan Lemon: Stacy recognized the texture of the cake was a lot like Sticky Fingers vegan bakery, which we tasted over the summer. 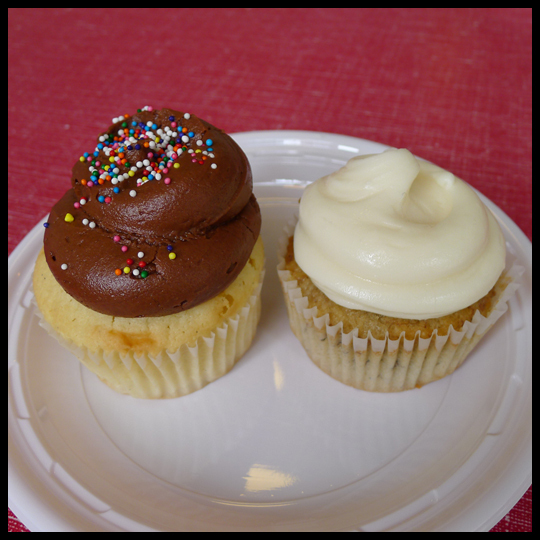 The cupcakes at BabyCakes are served cold, which is always a downside. Our first bite did not make a good impression and we only took a second bite to try and pin point the flavors. Despite the lack of wheat flour, the cake tasted floury and also bitter, probably from the spelt. It was hardly sweet, almost like a sugar cookie that suffers from too much salt and flour and not enough sugar in the batter. The frosting, which can sometimes redeem a cupcake, just made it worse. It was sticky, like a runny fondant that solidified due to being chilled. While we commend BabyCakes for their commitment to being all-natural and offering a healthier, non-processed option on the cupcake scene, it just doesn’t work for the normal cupcake lover. Little Cupcake Bakeshop was the biggest venue we visited during our cupcake crawl, with the most seating. Just like most of the bakeries, they were very busy, perhaps the busiest one we visited since people linger at the tables. They have a large display for their cupcakes and other confections, areas to watch bakers apply frosting and prepare confections, and a full service coffee shop. Although they were packed, they are also very well staffed. The selection looked amazing, so it was hard to choose. 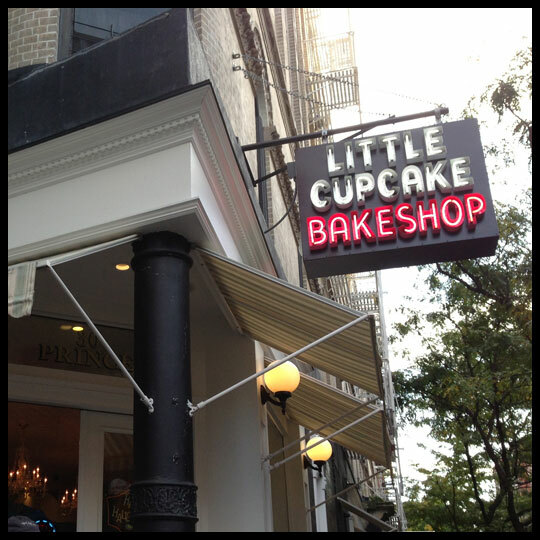 Their cupcakes range from $3–$3.50 for normal size cupcakes, but that’s average in NYC. Peanut Butter and Jelly: Stacy finally got a PB&J cupcake, one of her new favorites, and thought this one was delicious. She really liked how the jelly was swirled in the cake. Luscious Lemon: I choose this cupcake, which had a vanilla cake and was topped with lemon butter cream and a meringue swirl. While this cupcake was well made and tasty, I think the name is a little deceiving. I was expecting much more lemon flavor, but the flavor was subtle. 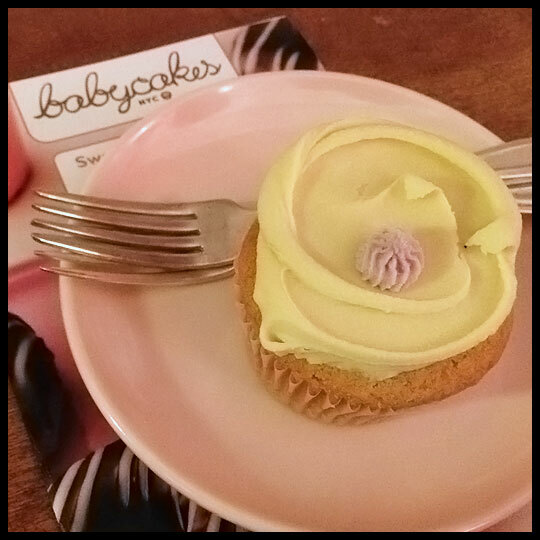 But after the previous lemon cupcake from Babycakes, I still thought it was refreshing and just what I needed. Mott Street: I took the Mott Street home with me, because after hearing the description, I had to have it. It was a vanilla bean cake soaked in Illy espresso and topped with mascarpone cream cheese frosting, then dusted in cocoa powder. The girl who described it compared it to tiramisu. I thought this cupcake was really great, with a light, fluffy, and moist cake. 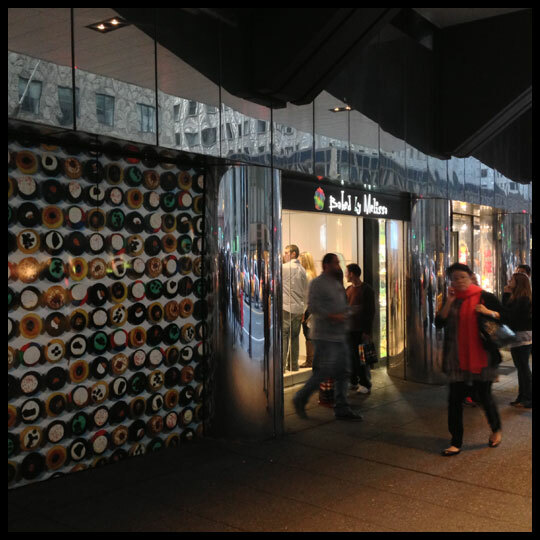 There was no way we could go to NYC without visiting Baked by Melissa, especially will all the locations they have now. Crusader Elisa even gave us her order before our trip, so we had to bring some back for her. We headed uptown, to Grand Central Station where there is a Baked by Melissa next door (a convenient location and also nearby to the restaurant our friend, Liz, works at and where we had dinner). The only new flavor we tried was the flavor of the month (read previous reviews here). We had a great day, filled with cupcakes and friends, so what more could we want? 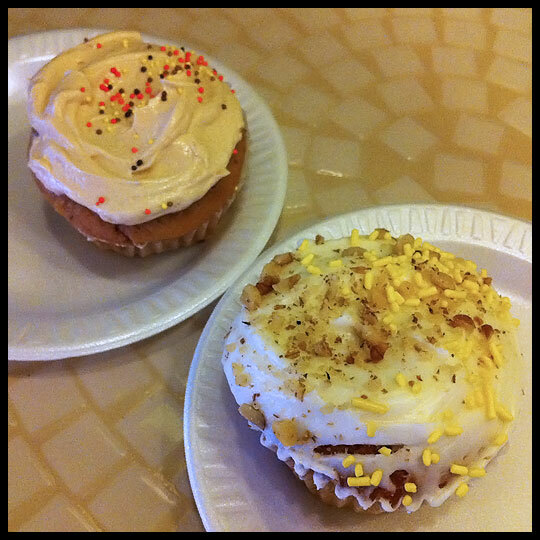 Stacy and I discovered a few new cupcake places that we now call favorites. It would be hard to choose just one place to visit. Super Sweet Sunshine had their amazing prices and above average cupcakes, Butter Lane had their unique menu approach that allowed for amazing flavor combinations, Prohibition has booze, and Little Cupcake Bake shop has treats that give the feeling of high-end cakes. 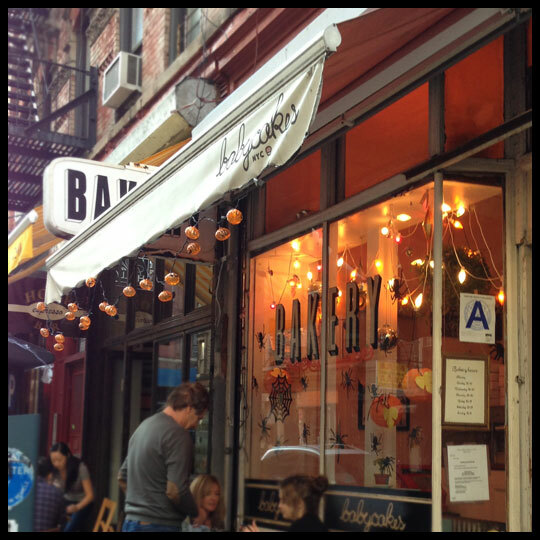 So depending on where you are in the East Village or Lower East Side and what type of treat you are looking for, we recommend checking out any of these four great places. 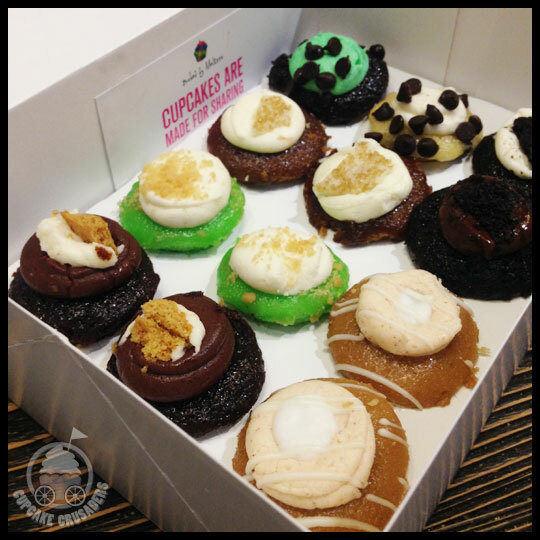 Then stop by Baked by Melissa for bite size cupcakes to-go. I can’t wait for our next trip to NYC, which will no doubt include cupcakes, but maybe next time we’ll also fit in a Broadway show! Day two of our NYC trip started off with a beautiful sunny day! After a failed attempt to use public transportation (I am determined to use the bus next time), we hailed a cab in true New York fashion and headed down to 20th Street, where we were meeting up with a friend for brunch at Tipsy Parson. 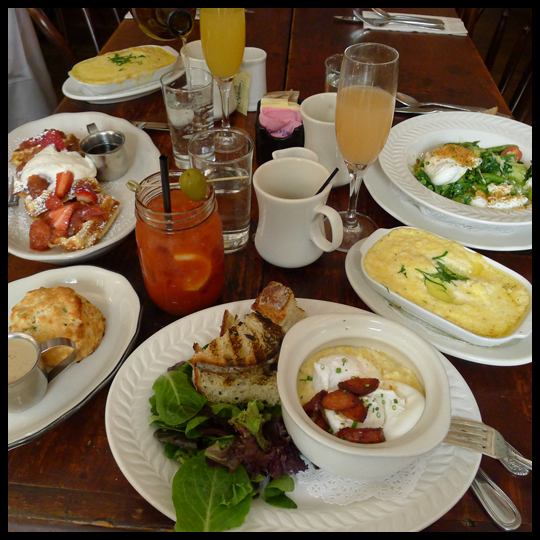 Knowing we would be eating plenty of sweet treats throughout the day, we stuck to a savory order for brunch: grits, eggs, veggies, and drinks of course! After brunch our next stop was the Chelsea Market. I had never been there before and Stacy knew I would love it! 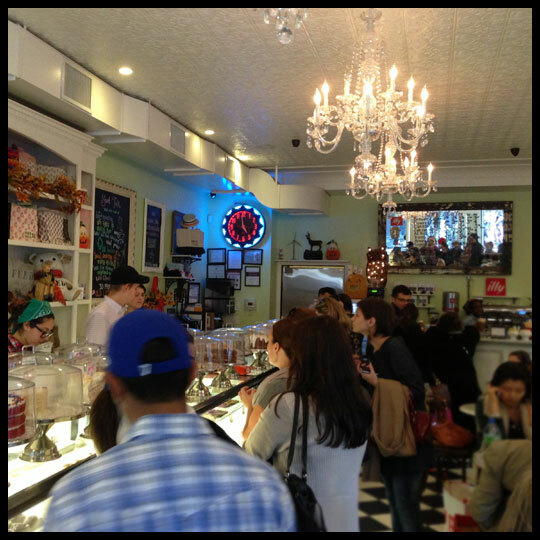 This is where we encountered our first cupcakes of the day at Eleni’s New York. After such a filling brunch, neither of us could imagine eating anything else, so we decided to take these cupcakes home with us. 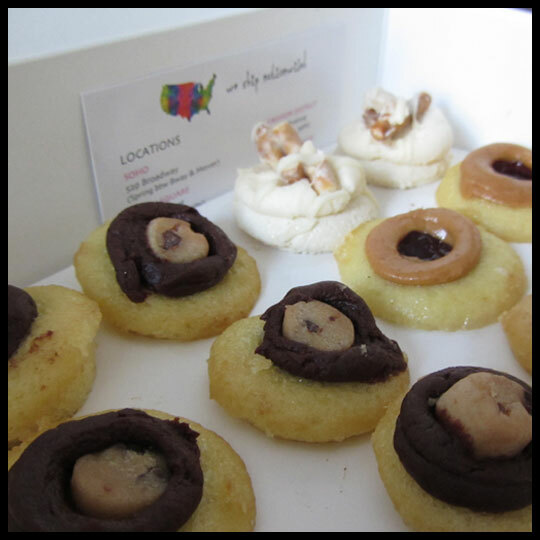 Packed away, these cupcakes were walked all over New York as well as being trekked all the way back to Baltimore! (I’ll come back to those though, since we didn’t eat and review them until later.) We also happened upon a bit of shopping and both ended up with perfectly sized Anthropologie shopping bags – which ended up being the perfect size bag to carry cupcakes in! 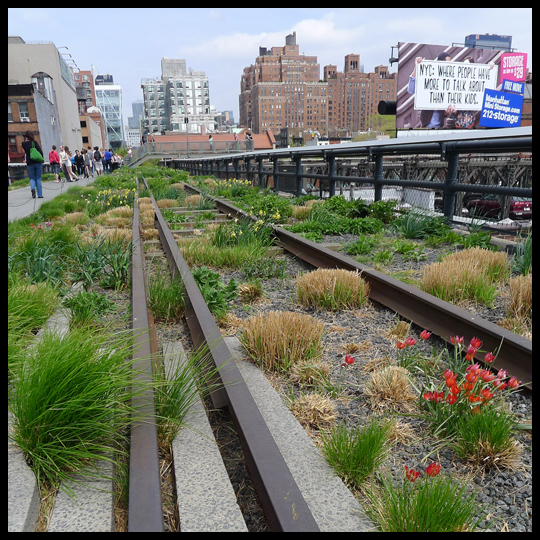 After the Chelsea Market, we walked The High Line, a public park built on a historic freight train railway, elevated above the streets of the city! Filled with beautiful flowers, trees, plants and views, The High Line is officially my new favorite thing in New York. The weather could not have been more perfect for a walk through the park, among the rooftops of New York’s West Side. 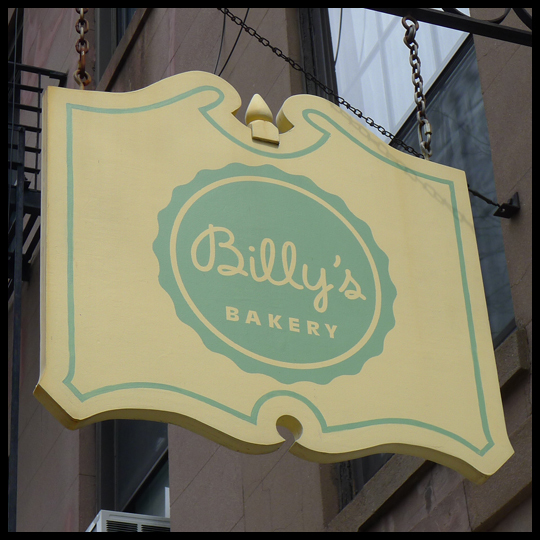 Lucky for me, Stacy plans out our NYC trips and knew Billy’s Bakery was located just a block away from the High Line on 9th Ave between 21st and 2nd Streets. While we were a little disappointed in the selection, I still managed to break our “one cupcake per location” rule and got two cupcakes to try! Stacy ordered hers and we were set to eat our first cupcakes of the day! The Vanilla cake was a little on the dry side, but the chocolate frosting was a very milk chocolaty and smooth. The stand out for me was the Banana; not too dense, which can make a banana cupcake taste more like a muffin, this was the perfect balance of real banana flavor and smooth cream cheese frosting. 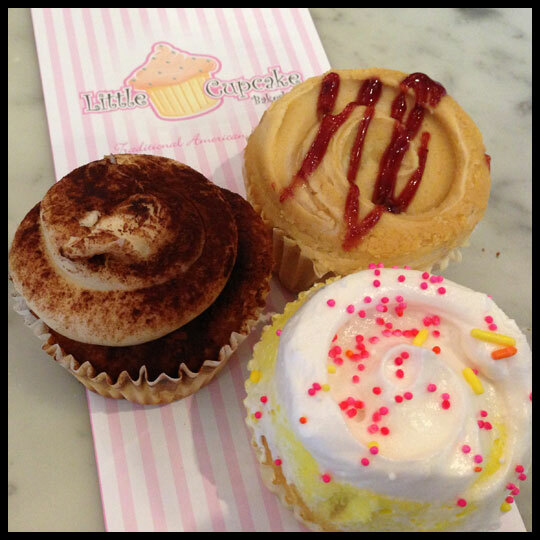 I enjoyed every morsel of this cupcake and hope they have it again next time we are in town. 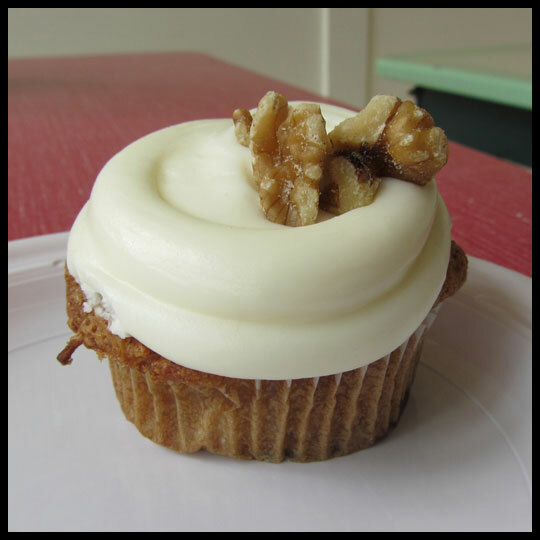 Stacy had this to say about it: “The Carrot Cake cupcake was probably the best carrot cake I’ve ever had! It was incredibly moist and full of shredded carrots, coconut, and I think even zucchini. 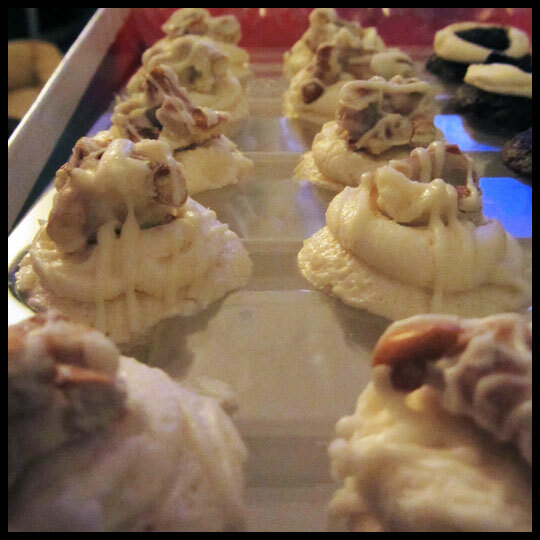 The frosting was a sweet and smooth cream cheese frosting, which in my opinion works the best with carrot cake.” After loving the Carrot Cake cupcake so much, Stacy knew she had to bring one back for Jenn, who we may need to give the title of “Carrot Cake Crusader.” (Jenn, surprise! Stacy has a cupcake with your name on it!) 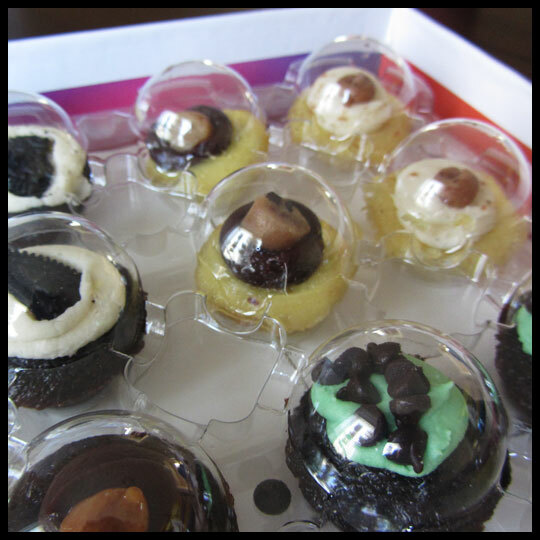 After buying the cupcake and the adorable box for it to be taken to-go in, we trekked on with cupcakes in hand! From there we hopped on the subway – since we had the MTA cards, we figured we would use them – and headed up to Central Park. 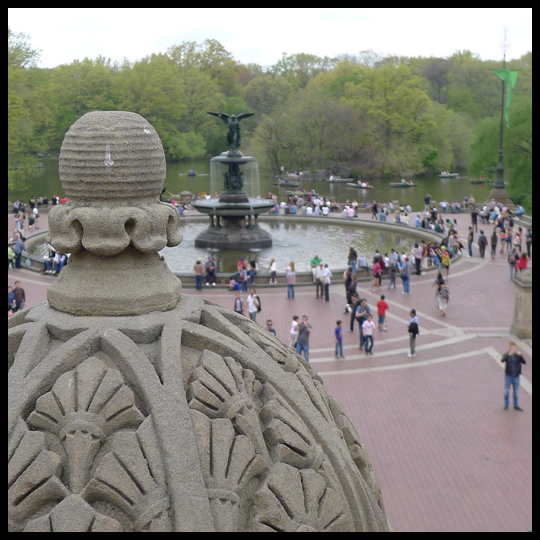 While I have been to New York City many times, and been to Central Park too, I had never been to see the Bethesda Fountain, so that was our first stop. From there we walked south through the park, landed in Sarabeth’s for some much needed, very late lunch, and then headed back to our hotel to pick up our bags. 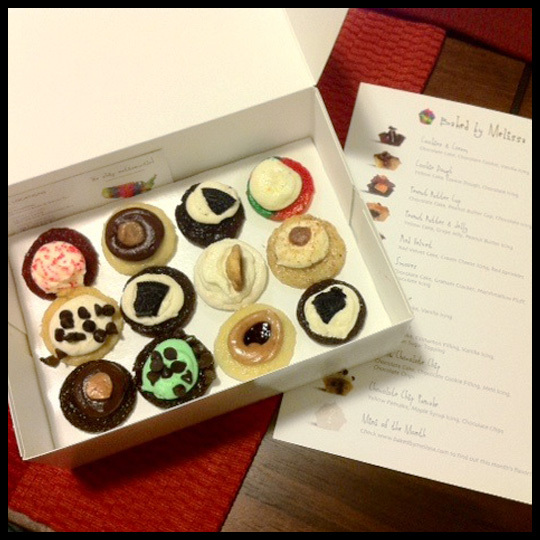 Our trip was nearing the end… but not without one last cupcake stop: Baked by Melissa. We both placed our orders, including a dozen of these quarter sized cupcakes for Jenn, carefully placed the boxes in our handy Anthropologie shopping bags and headed for Penn Station to catch the train home. 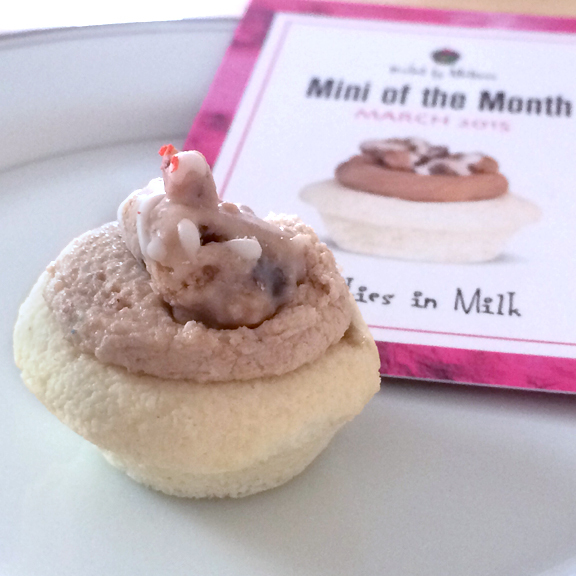 Being the very patient people we are, once on the train we almost immediately opened our Baked by Melissa boxes to try one of April’s Mini of the Month: Peanut Butter Fluff. And never missing the tiny details, she noticed they have personalized cupcake wrappers as well! What a great detail and great way to market their website! This cupcake may look like a mess – after being trekked around one city, on a train and car ride to another city, I was amazed any of the frosting was still on the cupcake – but it tasted like a raspberry dream! The cake had actual berries in it and the frosting was just the perfect amount of sweetness. 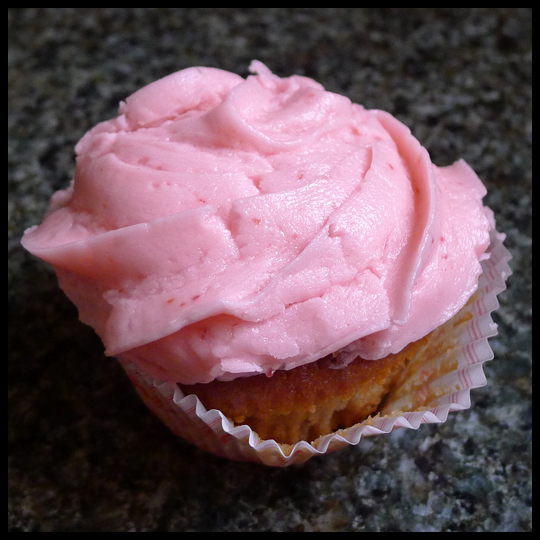 I could eat this cupcake for breakfast, it was that refreshing and light, moist and sweet! I cannot wait to go back and try more from Eleni’s! While our annual NYC Girls Trip was not the same without Jenn – and we kept saying to each other, “I wish Jenn were here” – it was a great trip! Stacy is the very best travel buddy, and to get to see so many new places, in one of my favorite cities, and eat so many cupcakes, made this trip one of the best yet! We are working to help end childhood hunger! It’s no secret that I am a sucker for great packaging. 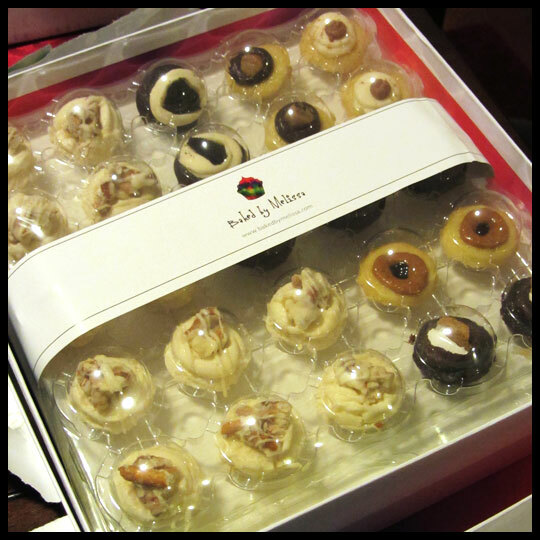 But when there are 25 delicious mini cupcakes inside that great packaging, I go weak in the knees. It’s a bit (or a lot) nerdy, but I just can’t help myself. 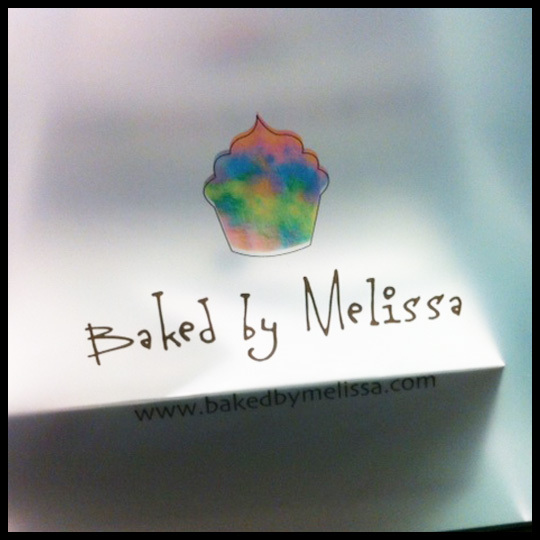 For Christmas my husband ordered cupcakes from one of my favorite NYC locations, Baked by Melissa. I was in awe of the packaging. 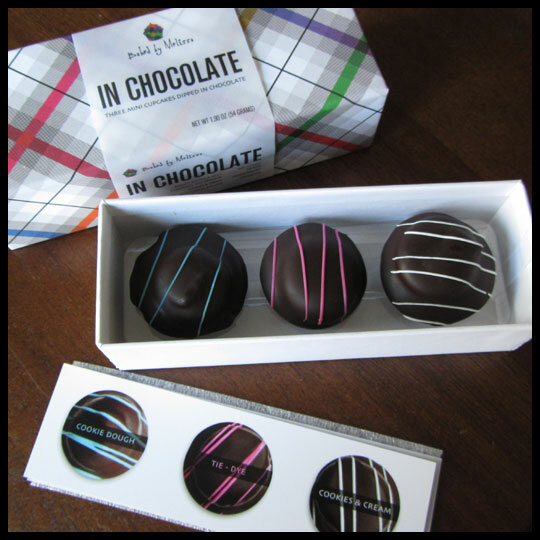 They arrived frozen, in a custom shipping box, complete with a custom printed Baked by Melissa ice pack. 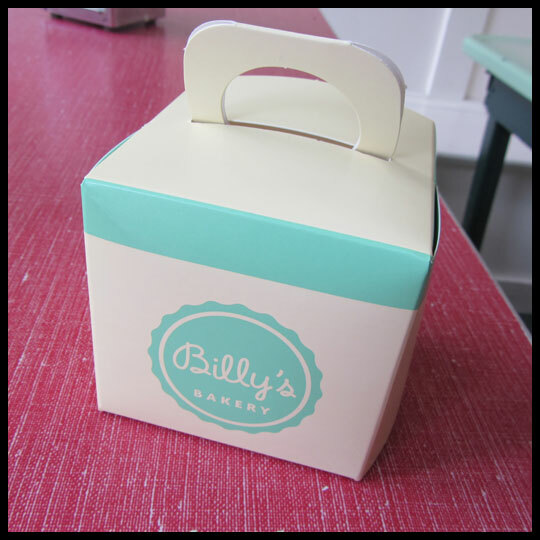 Since I’ve reviewed their cupcakes a couple times before (here and here) I’m going to focus on the amazing packaging. Inside the shipping box was the gift box that contained the tasty little gems. This sturdy box is not some cheap throw-away. 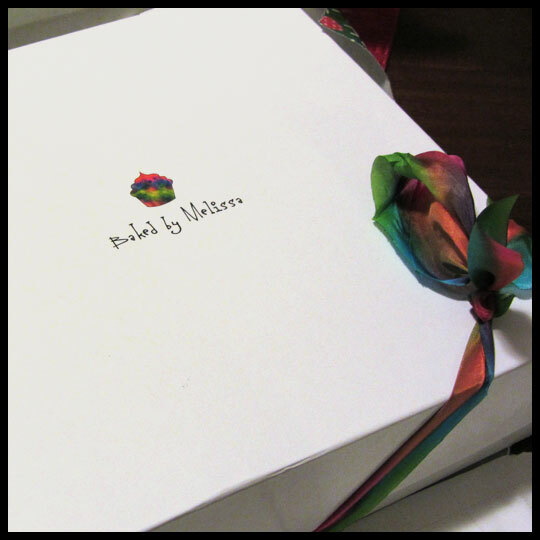 Adorned with their logo on the top, their tie-dyed pattern on the inside, and sealed with a tie-dyed ribbon, it’s a keeper. 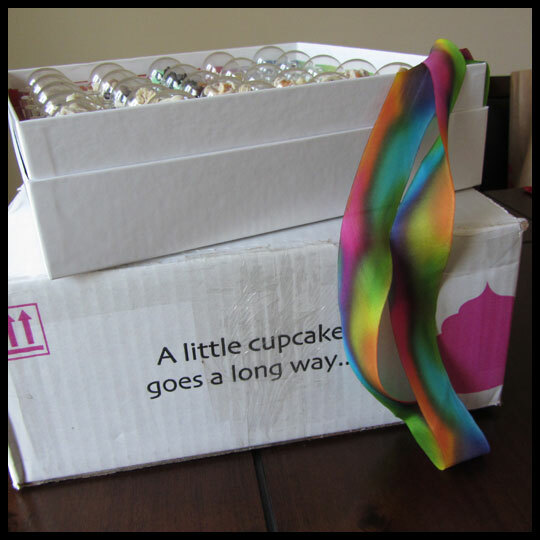 Once opened, you are face to face with ANOTHER piece of their unique packaging which keeps each tiny cupcake upright and protected from any rough handling that may occur during delivery. All 25 cupcakes were in perfect condition when I received them. 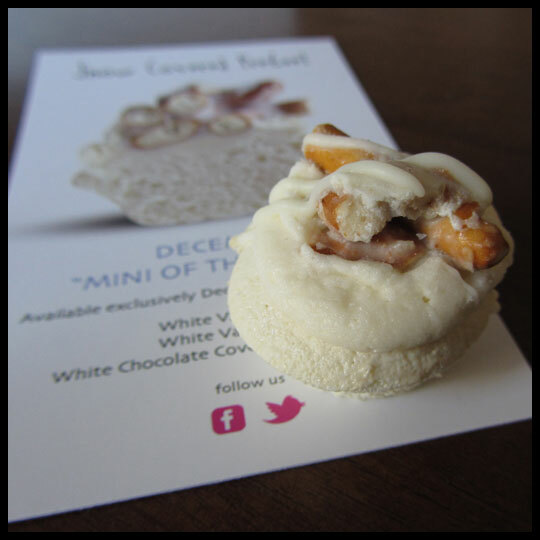 Since we really loved their December Mini of the Month, Snow Covered Pretzel, half of the container was filled with just them. The other half was a blend of some of our other favorite flavors like Cookie Dough, Cinnamon, and Peanut Butter & Jelly. The only downside to them being frozen and then thawed is that the pretzels ended up being a bit chewy. They weren’t too bad and the flavor was still great, it just lacked the crunch from the store-bought ones we initially tried. I was also excited to try the S’mores, since they were out of this flavor when I first went to their Fashion District location. Like the Snow Covered Pretzel, the graham cracker ended up being a little chewy, but overall, I still enjoyed this one too. 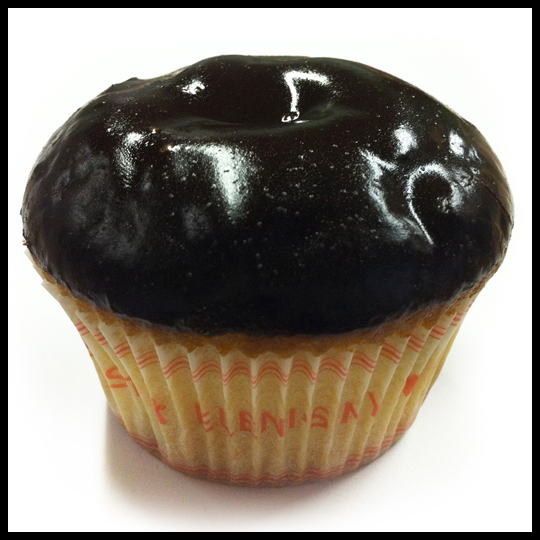 January’s Mini of the Month is New York Cream, a take on Boston Cream with a custard filling and a chocolate drizzle. Boston Cream cake and doughnuts are a favorite of mine, so I would love to try this cupcake, but unfortunately I won’t be able to get to NYC this month (and I can’t justify the high shipping rates and $25 minimum just to try one flavor). If you get a chance to try it, let us know how it is, we’d love to hear about it! 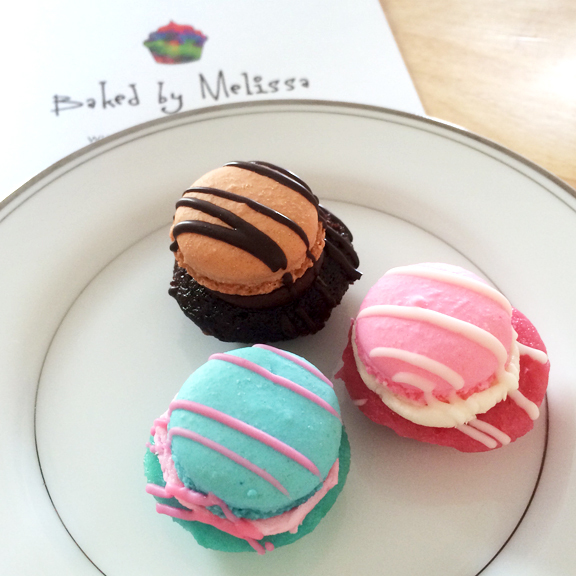 Baked by Melissa seems to be doing everything right. 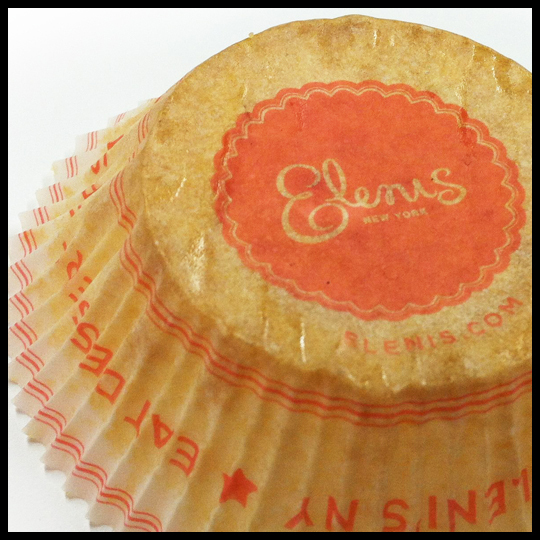 From their tasty little cupcakes to their quality packaging, they remain on my list of favorites. You may think that this is an extreme statement to make, but after my second visit to Baked by Melissa, I’m convinced it’s true. There is something so special and wonderful about popping a cupcake the size of a quarter in your month and the explosion of flavor that erupts from it. When you take that cupcake, and dip it in chocolate, it gets about a billion times better. 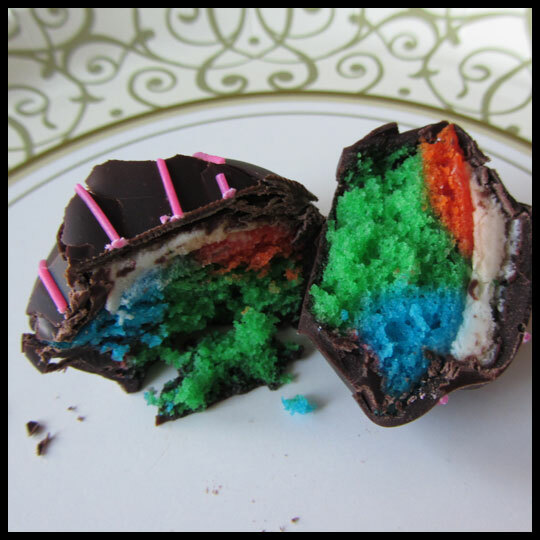 After thoroughly enjoying the “unwrapping experience” I decided I could wait no longer and selected the Tie-Dye mini cupcake covered in chocolate. I couldn’t have been happier with the flavors and textures. The chocolate shell offered a nice crunch, similar to a cake pop, but the inside was 100% cupcake. Soft cake and creamy frosting, it was perfection. This was actually a lot like the texture from a Popsy Cake, but the miniature scale made it so much easier to eat and enjoy. In an effort to savor the three that I had, I waited a couple of days for my next fix. 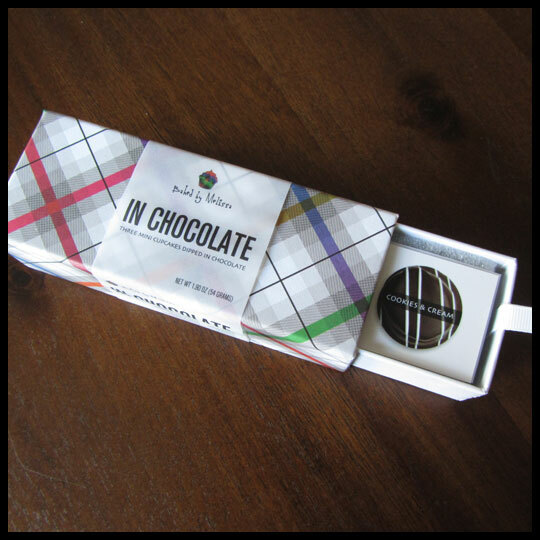 When the time came, I selected the Cookies & Cream, deciding to save one of my favorite Baked by Melissa flavors, Cookie Dough, for last. The Cookies & Cream actually tastes a lot like the cupcake even with the chocolate coating. 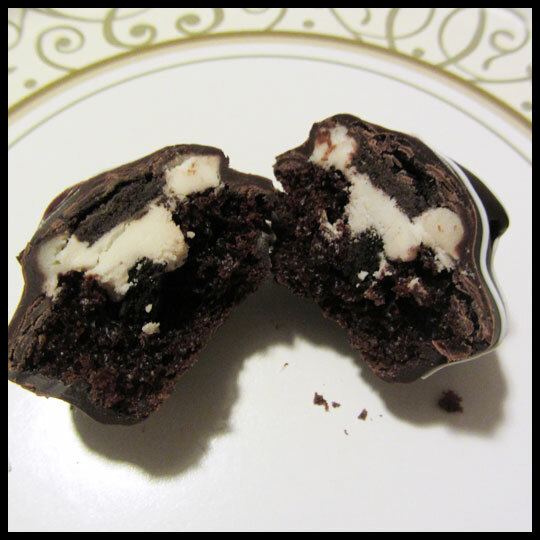 Unlike the Tie-Dye, which typically doesn’t have any chocolate, the Cookies N Creme is chocolate based. I still loved the added crunch the the chocolate shell provided. The Cookie Dough isn’t going to last in it’s safe little box much longer. I’ve got big (uh… little?) plans for him tonight. While I haven’t tried it yet, I already know it’s going to be amazing. It’s $10 for a box of 3 of these specialty cupcakes, but go ahead and splurge. It’s the holiday season and that’s what it’s all about, right? You won’t be disappointed. On top of the excitement of finally sampling In Chocolate, Crusader Elisa and I also got Baked by Melissa’s mini of the month for December, Snow Covered Pretzel (as well as all the other flavors I reviewed here). This is by far the best (non-chocolate-dipped) cupcake I’ve had from them. It was Elisa’s favorite. It was my favorite. And my hubby actually said, “that puts a smile on your face.” And it totally does. The sweet/salty and soft/crunchy combos going on in this cupcake are amazing. We all wish that we had bought more of these and sad that it is only a monthly flavor. Hopefully, they will bring it back at some point, becuase it really is THAT amazing. 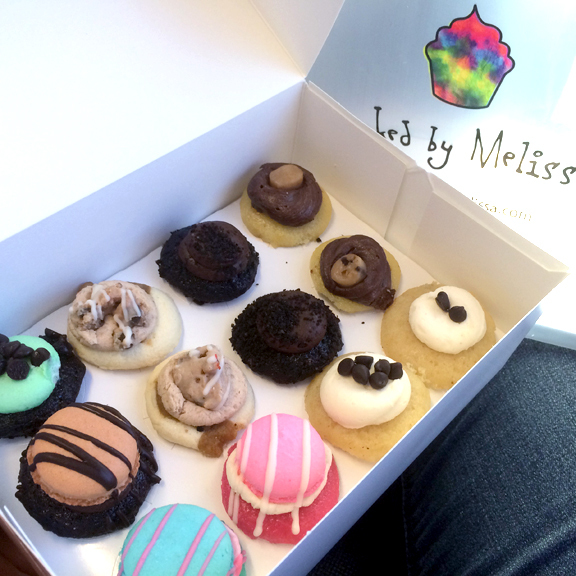 So, if you are visiting or living in the NYC area, get yourself to a Baked by Melissa to try these while you can. If you aren’t in that area, then you can always place an order on their website. It’s totally worth it. 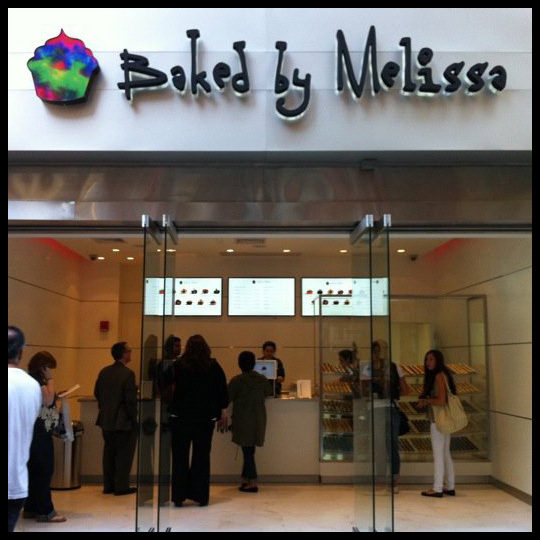 Photo borrowed from Baked by Melissa’s Facebook Page (click here). No harm or infringement intended. This past weekend I visited a couple of friends in NYC and planned to stop at Baked by Melissa on my way back to Penn Station before heading home. I wasn’t there long, but the staff was very friendly and I could tell would have answered any questions I had. They made sure I had a menu to take with me so I could use it as a guide when I got home. I asked for one of each flavor, and since I was getting a dozen, two had to be repeated. The shop doesn’t have any space for seating, which is a little disappointing if you wanted to sit and enjoy a few, but since I was just grabbing and going, it wasn’t a big deal. I would guess that in this area most people are doing the same. As I waited for my train to New Jersey to arrive, I was tempted to begin tasting, but I wanted to be able to savor each tiny treat, so I waited patiently, staring at the bag in anticipation. Since they were so small and I was sharing them with my husband, I decided that we would eat them all that night. This was not hard to do, so I would highly recommend that everyone should get at least one of each flavor when visiting. It’s $10 for a dozen, which might seem pricey to some (in fact a girl in front of me said, very loudly, “I’m not paying $3 for 3!”), but my thought on this is that most cupcakes are about $3 a piece, so it works out to be about the same price/size. Since there was such a variety, I’m going to focus on the least favorite, the favorites, and the most unique ones. We ended up with 10 different flavors total (8 are pictured above). The least favorite was the Red Velvet (not pictured). The cake was dense and a little dry, however, my husband and I both agreed that the cream cheese frosting was great! 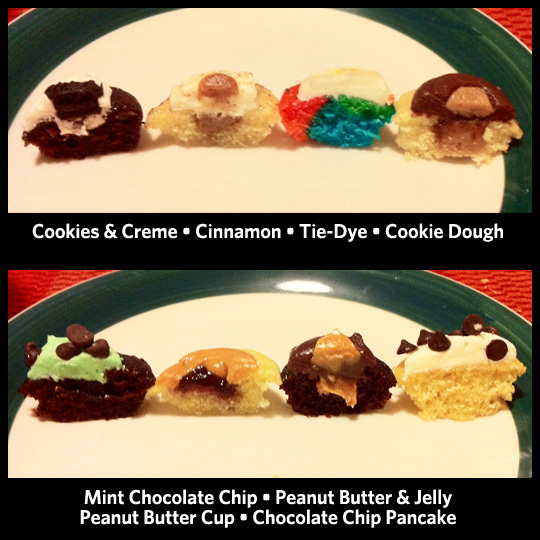 Our favorites were: Mint Chocolate Chip, Peanut Butter & Jelly, and Cookie Dough. My husband really wished that I had duplicated the Cookie Dough one. I think, when I go back, I will make sure to get a bunch of those for him. The Peanut Butter & Jelly ended up being a total surprise to him. He’s a big peanut butter and chocolate fan, and doesn’t even eat PB&J sandwiches, but he really enjoyed this one too. My top picks were the Mint Chocolate Chip and the PB&J. There was a tie for the most unique one: Chocolate Chip Pancake (shown above) and Milk & Cookies (show below). The Chocolate Chip Pancake really tasted like a pancake. 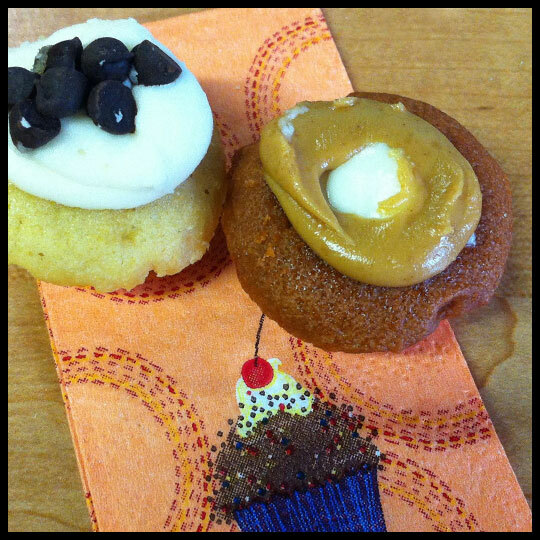 The cake was more dense than a typical cupcake, similar to a pancake, and the maple frosting was full of syrup-y flavor. When we tasted the Milk & Cookies we didn’t know what to expect. This is their flavor of the month, so it wasn’t on the menu and I hadn’t thought to ask when I was there. Our first reaction was, “It’s really clean tasting.” It’s very subtle and not too sweet. I would really like to try this one again, now that I know what flavor it is, but unfortunately won’t get back to NYC until December. Overall, every cupcake that we tried was moist, light, and full of flavor (with the exception of the Red Velvet). This shop is located close to Penn Station, so I know that I will be going there again and again before heading home. Whether you are a local or a tourist I would highly recommend stopping at one of their 4 locations in SoHo, Union Square, Grand Central, or the Fashion District. Next time I’m not so sure these little morsels of tastiness will make it back to Baltimore.